Cinnamon swirl bread dipped in batter, fried until golden brown and served smothered in maple syrup. By the end of the week my cinnamon swirl bread was no longer as fresh as it had once been and that meant that it was time for French toast. 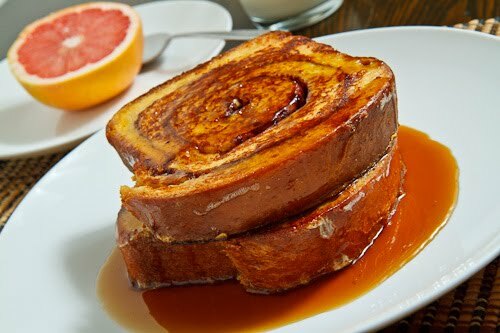 French toast is a dish where bread is dipped in an egg mixture and then fried until golden brown. It can be a savoury dish but more commonly it is served as a sweet dish and I enjoy smothering it in maple syrup. French toast is super easy to make and it takes almost no time at all. You simply mix some eggs and milk, dip the toast in, fry it up and then top as you like. This cinnamon swirl French toast was the perfect end to an amazing cinnamon swirl bread! Mix the milk, eggs and vanilla in a wide dish. Dip the bread into the egg mixture to coat on both sides. Melt some butter in a pan and fry the slices of bread until golden brown, about 3-4 minutes per side. Amazing. Your cinnamon swirl recipes are so awesome. Divine! What an awesome treat. French toast is amazing! I normally sprinkle mine with cinnamon sugar so I like the fact that the cinnamon is already in the bread here. I canhadrly believe that the bread was stale, but I will take your word for it! French toast was a brilliant idea!! Que maravilla, esto tiene que ser delicioso. This is probably the best way to have french toast – with a cinnamon swirl in it. It looks delicious, as always. Yum! You had me at cinnamon swirl. I would add some raisins too! That is a brilliant, genius idea! This looks delectable! I'm very tempted to make this bread. Love that it's so versatile. Always a great way to get rid of good bread. I think this would make good bread pudding too! yum. and that other idea to use it for apple and cheese sandwich – i likey! Kevin, when I saw your recipe for cinnamon bread, French toast was my first thought! I didn't have time this week to bake fresh bread, plus it was close to 100 degrees here in AZ…so I bought some cinnamon swirl bread and made French toast! Can't wait to see what's next! One time I had French toast at a diner made from sliced cinnibons. It was way too much, but this looks PERFECT. Oh my totally delicious Kevin! Just what I've been waiting for! I'd love to make a stuffed french toast with this bread, YUM! I love love love French toast. And to make it with the cinnamon swirl bread is genius! Man, I need to make that cinnamon bread just for this! Looks amazing. This looks great. I made something similar with my Daring Bakers challenge using yeasted coffee cake. Oh dear gawd!!! that looks so freaking good! I may try this!! Do you think you could sub the milk for soy milk? I'm trying it now anyway, but I'm not sure how it will work out. Here's hoping for the best! Sand: I have not tried using soy milk but it should work.